A Concise Introduction to Logic 12 Edition Unsurpassed for its clarity and comprehensiveness, Hurley's A CONCISE INTRODUCTION TO LOGIC is the #1 introductory logic book on the market. 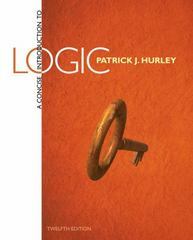 In this Twelfth Edition, Hurley continues to build upon the tradition of a lucid, focused, and accessible presentation of the basic subject matter of logic, both formal and informal. The edition's new Previews connect a section's content to real-life scenarios, using everyday examples to "translate" new notions and terms into concepts that readers unfamiliar with the subject matter can relate to. An extensive, carefully sequenced collection of exercises guides readers toward greater proficiency with the skills they are learning.